Posted on September 12, 2017 at 12:56 pm. The Lake George Regional Chamber of Commerce & CVB Inc. partners with local restaurants semi-annually to offer special three-course menus at an incredible value. This year marks our 11th anniversary of showcasing the culinary talent in our region with this fun promotion. We offer two weeks out of the year for Restaurant Week. 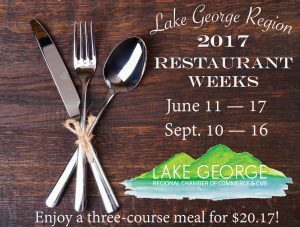 Join us for Restaurant Week 2017, and Sunday, Sept. 10 to Sept. 16.